This is the second part of a two part blog on time tracking and time analysis to improve productivity. Go and read part 1 if you have not already. If your priorities are A, B & C and you spend all your time on X, Y & Z then you will never make the progress you intended. In Stop wasting time: Be more productive I cover the importance of task selection. It is critical to align how you spend your time with the things you want to get done. If X, Y & Z are things that need to be done then make sure they are a planned part of the day. A packed schedule allows no time for emergent tasks. Some things come out of the blue and are truly unexpected. Other unexpected things such as a boss wanting an update before she goes into a meeting are more predictable. Either way having some slack in the schedule can help accommodate this. Trying to fill every minute of the day with tasks leaves not flexible and can hide priorities. Keep buffer time in your schedule to prevent the unexpected taking you off course. Work out what your most important tasks are. Commit to achieving these. If you complete them you can always add more tasks to the list. Where what I? Oh yes, interruptions. Interruptions are the silent killer of productivity. Spending 2 hours on candy crush/Facebook can be an unproductive indulgence but at least you know it’s happening. Interruptions force a context switch. This taxes the working memory and prospective memory – and memory is often a weakness in dyslexics and dyspraxics. Some interruptions are unavoidable, some can be minimised, some are self-inflicted. Email is a great example of a self-inflicted interruption. If your email client is always open in the background and pops up to inform you that new mail has arrived then you are distracting yourself. If you need to focus to complete a task close down email and focus. If you continually flit between email and the task at hand then you are multitasking and incurring a 40% productivity hit in the process. Focus on one thing at a time and use the saved time to do something productive (like go for a bike ride). This is a special case of interruptions. Many people have meetings at set times which can lead to constant context switching. There may be other reasons that cause a task to be broken up into little time chunks. The effect is a particular task spans the whole day like a bar code – a little here, a little there. If these chunks are too small there is a big overhead in switching between tasks. In my time boxing blog, I recommend chunks of 25 minutes but there is nothing stopping you string together multiple slots so long as you take a break in-between. If you have one thing you must get done in a day then start on it first thing. Take breaks when needed but don’t work on anything else until it is completed or stalled. A typical reason for a task stalling in needing input from someone else. We have all heard of the 80/20 rule. 80% of the time spent doing a task is in the last 20% of the execution. If you get a task finished to a good enough standard it might be more effective to call it complete and work another task. Investing a load more time to make it better is a waste if it is already good enough. Of course, it can be hard to judge when something is good enough. All is not lost if you can’t tolerate submitting less than perfect work. When the work is good enough pause and move on to the next task. Keep working through your priorities. Each time you take on a new task ask yourself if an hour on the new task would be more beneficial than an hour polishing the good enough task. When a bit of polish is the best use of your time you can indulge your perfectionist tendencies guilt free. If you repeatedly take on tasks you could delegate because “it will be quicker if I do it” then you are squandering your time. Yes it might take more of your time to get someone to do the task than it would have taken but this only holds true for the first few iterations. Then it takes less of your time. Then it takes none of your time. Delegating also has the advantages of removing single points of failure (as now multiple people can do the task) and growing the capability in your team. You can even delegate if you have no one working for you thanks to virtual personal assistants. I use the term unproductive broadly in this context. Taking good care of yourself – food, diet, exercise and above all sleep is a productive use of your time. You can’t drive a car forever without stopping to refuel and the same is true of your mind. I find cycling a great way to unwind and also for my mind to join ideas and help me work through problems. On the flip side, I’ve invested a ridiculous amount of time in candy crush and other smart phone games that probably have not been an effective way to relax. I probably also spend too much time on Facebook. Performing a time tracking and time analysis exercise can highlight how much time is sunk into little treats. 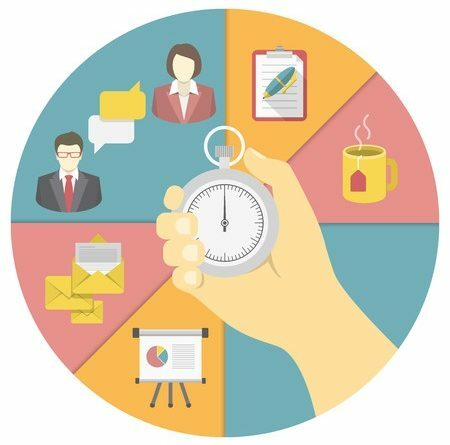 In addition to spotting where your time went time tracking and time analysis has some other handy benefits. A record of time spent can be a useful insight into how long tasks take to complete. This can be used to help judge how much can fit into a day which makes daily planning a more informed process. Tracking time also highlights recurrent activities which might be opportunities for automation or outsourcing. Automation and outsourcing are beyond the scope of this post. ← Agh – where did all my time go?